It's a known fact that loud noises and sounds can have long-lasting, damaging effects on your hearing. The worst part: Once your hearing is gone, it's gone forever! L&L Group high fidelity ear plugs help protect against hearing loss and ear damage by effectively reducing the volume of noises without muffling the sound. Hearing loss is preventable yet millions of people damage their hearing from exposure to loud, continuous noises and sounds. Our earplugs are designed to discreetly fit most ear shapes and sizes for a snug, secure feel that protects hearing while still maintain voice and music clarity. From musicians to construction workers to parents of loud or teenage children, our ear plugs are perfect for anyone in a loud environment! They may also help people suffering from Meniere's disease, Tinnitus, Misophonia, deafness and ringing ears. If you want to feel confident protecting against hearing loss and other hearing issues, while maintaining voice and music clarity, try our transparent High Fidelity Earplugs by L&L Group! **Your Satisfaction Is of Utmost Importance to Us, We Offer All Customers A 60-Day Money-Back Guarantee! 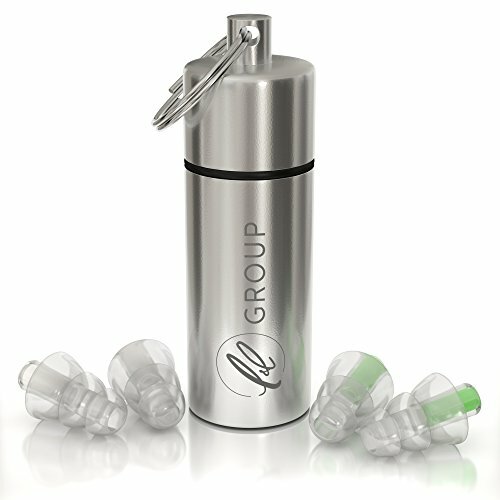 Use Our Autumn Discount Price - Add L&L Group High Fidelity Ear Plugs to Cart Now! ENJOY MUSIC SAFELY - L&L high fidelity ear plugs are engineered to filter out the most harmful frequencies but leave the quality and clarity of sound intact! FLY IN COMFORT - reduce the engine noise and airflow to inner ear thus modulating air pressure responsible for expansion of the eardrums and flight discomfort. HUNT & SHOOT SAFELY - hearing loss affects thousands of guns and shooting enthusiasts each year, shooting ear plugs significantly reduce the noise but allow you to hear the speech clearly. WHY EAR PLUGS? - L&L Ear Plugs are hyperallergenic, made from food grade silicone, designed to perfectly fit adult ears and are discreet and almost invisible when used. If you have any questions about this product by L&L group, contact us by completing and submitting the form below. If you are looking for a specif part number, please include it with your message. Winchester Hearing Protection Ear Plugs for Sport Shooting Range Hunting - Pink, 26db Protection, Easily Fits in Pockets.